Ever since fans learned that Andy Serkis was playing a character named Supreme Leader Snoke in Star Wars: The Force Awakens, rumors had run rampant that this villain may actually be Darth Plagueis, the Sith Lord who trained Darth Sidious (a.k.a. Emperor Palpatine) before the events of the original trilogy. Andy Serkis revealed in numerous interviews, including one from January, that Snoke isn't actually Darth Plagueis. But some fans are still convinced that Plagueis, who was killed by his apprentice Palpatine, was able to reincarnate himself and become Supreme Leader Snoke. Which will be revealed in Star Wars 8. For those who still believe in this popular fan theory, LucasFilm's Pablo Hidalgo took to social media this week to debunk it. Some fans theorized that Snoke was Plageuis when the official soundtrack for Star Wars: The Force Awakens was released, which featured a track entitled "Snoke." Many claim that this is the same music played during a pivotal scene in Star Wars: Episode III - Revenge of the Sith, where Palpatine discusses Plagueis with Annakin Skywalker. This scene revealed that Plagueis could save others from dying, but he eventually couldn't save himself. Although some believe he was able to revive himself after he was presumably struck down by Palpatine/Sidious' force lightning. During several different Twitter exchanges, Pablo Hidalgo, who serves as a creative executive and part of LucasFilm's story group, said in no uncertain terms that Darth Plageuis is dead. "Sidious killed Plagueis. Ascending to master. As is the way of the Sith. He is dead. There you go. Three words." Andy Serkis has stated on different occasions that Plagueis wasn't around during the original trilogy. But he was present during the Clone Wars. 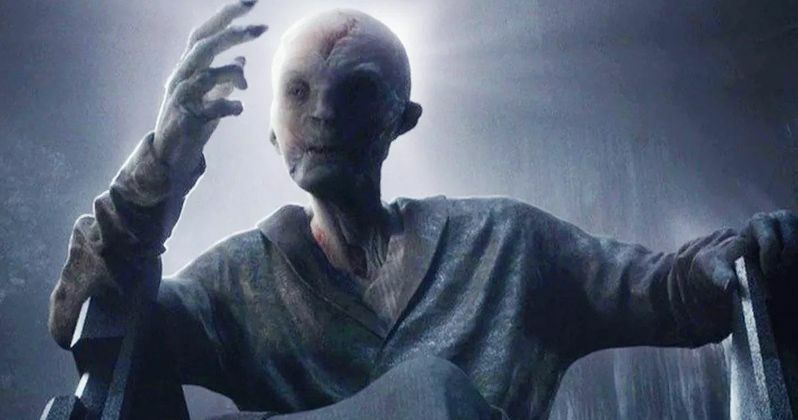 Some have speculated that it may have been the regenerative process that left Snoke's face so wrinkled, and that he was biding his time during the original trilogy to find the right moment to strike again. Serkis has even hinted that he, himself, may not know the full story behind Supreme Leader Snoke, which isn't terribly surprising since we don't know much about Star Wars: Episode IX quite yet, except that it will be directed by Colin Trevorrow (Jurassic World) and will be released sometime in 2019. Star Wars: Episode VIII is currently in production under the direction of Rian Johnson, who recently teased that they have passed the halfway point in the production. LucasFilm hasn't released any official story details as of yet, but there have been rumors that the story follows Rey (Daisy Ridley) as she starts her Jedi training with Luke Skylwalker (Mark Hamill). Other rumors suggest that Poe Dameron (Oscar Isaac) and Finn (John Boyega) will be captured by Kylo Ren (Adam Driver), in an attempt to lure Rey out of hiding for another epic showdown. We know that Snoke was able to seduce Kylo Ren to the dark side of The Force, leading him to kill off Luke Skywalker's Jedi trainees, causing Luke to go into exile. Still, there isn't much else we know about Snoke or his master plan quite yet, but we'll continue to keep you posted as soon as more details surface. Until then, check out these tweets from Pablo Hidalo, which shoot down the Snoke-Plagueis theory. @Daniel_Outhier@Gary_Thursby@timvitkuske Sidious killed Plagueis. Ascending to master. As is the way of the Sith. @MarissaTalchi@Daniel_Outhier@Gary_Thursby he is dead. There you go. Three words.